Raheem Sterling official debut was the biggest point of interest after his £49M transfer from Liverpool. I think he has a lot of potential and can really become the best English player, but I can’t avoid thinking he was a bit overpriced. Also, Man City's possession style presents some challenges he rarely faced as a Liverpool player. After the starting lineups were announced, the inclusion of Wilfred Bony ahead of Sergio Aguero was a surprise, although there's not much to say about it. Aguero is probably the best striker in the Premier League and most certainly this decision had to do with his involvement in Copa America. The final talking point before the game was Pellegrini’s decision to start the season with Mangala as central defender. I must say I know Mangala pretty well and he is one of the best central defenders in the world in terms of aerial and physical ability. But, these qualities are most often than not, over-shadowed by his fragilities: concentration and technical ability. The latter can be identified when he is pressed or has to conduct the ball. On the other hand, his concentration issues represent a major handicap as he quite often gives away silly free-kicks (too agressive!) and the occasional blunder. Trading-wise, this was the perfect example of how preparation can be useful, as this match was as predictable as it gets. Like I stated, in a more detailed way, in my Premier League review, Man City is the more dominant team in the country, playing a possession-based style with a lot of ball movement. 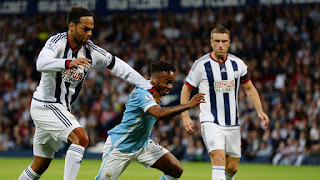 WBA in turn, is probably one of the most direct Premier League teams, especially against strong opposition. Tony Pulis doesn't rate passing number stats as WBA game plan, once they recover possession, is based on reaching the opposition are as fast as they can. Based on this premises, the first half was played in WBA's half and Man City dominated completely. 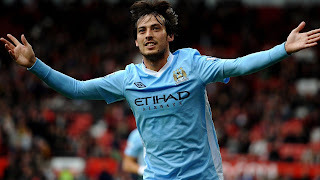 With Silva giving positioning, timing and technical abillity masterclasses, Man City reached the break leading by two goals. I have to say Silva is a joy to watch, he'll probably never play for them but for me he's a perfect example of Barcelona's DNA! Mixing a bit of trading in this analysis, there was not a single football reason to back WBA in this half as this match was perfectly one-sided, which is not common in the Premier League. Of course, there could be market reasons to back WBA, for instance if the price for their win was 100 with 0-0, I'd be all over it. You don’t have a choice sometimes, if someone offers you a new and functional vacuum cleaner for 1EUR, you have to buy it even if you don’t need it! Of course, it can help in your domestic duties but even if you already have one, you can always sell it on eBay for 20/25 EUR! Second Half – No drama this time, as Kompany finishes it! The game changed slightly in the opening minutes as WBA was able to press and force Man City to commit some minor mistakes like giving away some free-kicks. This is classic Man City and although the game was completely controlled by them, if they had conceded in this period, I could be writing a different review by now. But, nothing happened and in 58th minute Kompany sealed the win with a header from a corner kick. Sterling is still adapting to the new reality as he now plays for a team who is constantly on the opposition half. This means he'll have to learn how to play with less space available. Nonetheless, after the first goal, Man City was able to do some quick transitions and it was obvious that Sterling was more adapted to this kind of play. Bottom-line being, the great players always find a way and if Sterling is the real deal he’ll find it sooner or later.